Definition at line 37 of file StackProtector.h. Definition at line 107 of file StackProtector.h. References copyToMachineFrameInfo(), getAnalysisUsage(), llvm::PassRegistry::getPassRegistry(), llvm::initializeStackProtectorPass(), runOnFunction(), and shouldEmitSDCheck(). Definition at line 520 of file StackProtector.cpp. References E, llvm::DenseMapBase< DerivedT, KeyT, ValueT, KeyInfoT, BucketT >::empty(), llvm::DenseMapBase< DerivedT, KeyT, ValueT, KeyInfoT, BucketT >::end(), llvm::DenseMapBase< DerivedT, KeyT, ValueT, KeyInfoT, BucketT >::find(), llvm::MachineFrameInfo::getObjectAllocation(), llvm::MachineFrameInfo::getObjectIndexEnd(), I, llvm::MachineFrameInfo::isDeadObjectIndex(), and llvm::MachineFrameInfo::setObjectSSPLayout(). 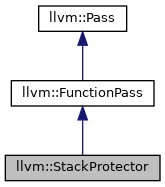 Definition at line 72 of file StackProtector.cpp. Definition at line 77 of file StackProtector.cpp. References llvm::classifyEHPersonality(), llvm::dyn_cast(), E, llvm::StructType::element_begin(), llvm::StructType::element_end(), GEP, llvm::StringRef::getAsInteger(), llvm::DominatorTreeWrapperPass::getDomTree(), llvm::Function::getFnAttribute(), llvm::GlobalValue::getParent(), llvm::Function::getPersonalityFn(), llvm::TargetMachine::getSubtargetImpl(), llvm::TargetSubtargetInfo::getTargetLowering(), llvm::TargetMachine::getTargetTriple(), llvm::Attribute::getValueAsString(), llvm::Function::hasPersonalityFn(), I, llvm::isFuncletEHPersonality(), llvm::Triple::isOSDarwin(), llvm::Attribute::isStringAttribute(), SI, llvm::ARM_MB::ST, and llvm::Value::users(). Definition at line 516 of file StackProtector.cpp. 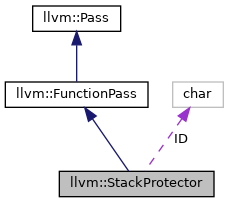 Definition at line 105 of file StackProtector.h.